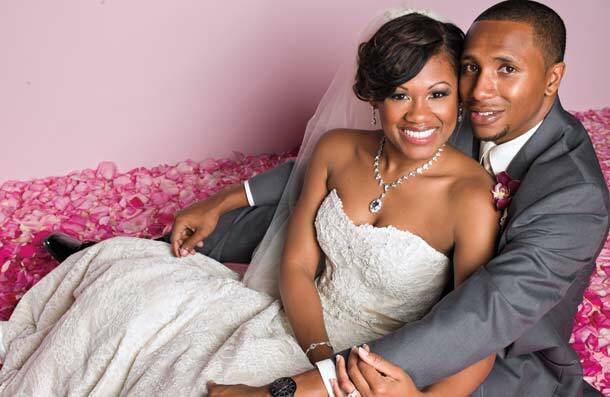 As Aaron begin to plan a proposal for Kyla, he considered it a sign when multiple friends emailed him information on the ESSENCE Storybook Wedding contest. He wrote a letter about why his lady deserved a fairytale wedding hosted by the magazine. From 200 letters, Aaron was selected among six finalists and the couple was flown to Walt Disney World so he could propose. While there at an intimate restaurant, Aaron and Kyla fed each other desserts while a harpist played “A Whole New World,” one of the couple’s favorite tunes. The waiter then brought out the final course—an engagement ring. Aaron’s heartfelt proposal, paired with Kyla’s social media campaigning, won over the hearts of ESSENCE readers. After more than 10,000 votes for the ESSENCE Storybook Wedding were cast, the happy couple were named the winners.